In a world where politics have been so theatrical, I think it is an apt time to look at something a bit more subdued. Here is The Cinema Cabin’s Top 5 Movie American Presidents. Even though this film is set 500 years in the future, President Dwayne Elizondo Mountain Dew Herbert showcases similarities with the current head of state. Loud, Politically incorrect, theatrical and lies through his teeth and people believe him. 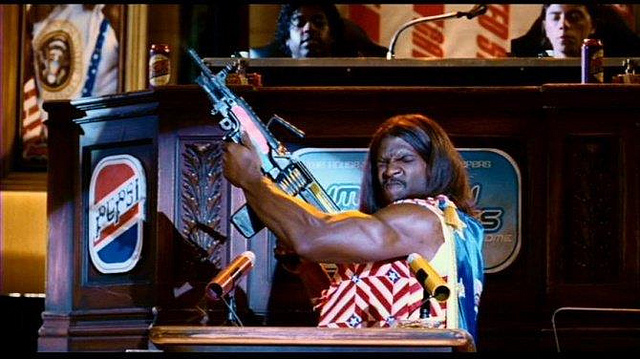 Terry Crews portrayal of the President of the United States would be hilarious if it wasn’t so close to reality. Or maybe it is even more funny because we are living it. Anyway, this is from a film that has flew under the radar of many and it a shame because this is a brilliant character and it is Terry Crews going over the top. An outlandish president then but now one could call him electable. Played by the fantastic Peter Sellers and in the titillating classic that is Dr Strangelove, President Merkin Muffley has to deal with the lunacy of the American government and their bloodthirsty desires. Sellers is brilliant as President Merkin Muffley and he is the only president on this list with a giant war room that has giant maps on the walls. The phone conversation between the President of America and the USSR President always has me in stitches and showcases the pure comedic talent of Peter Sellers. When Earth is endangered by a giant Comet, you need a president that will be calm, measured and hopeful. His voice like a warm hug. if there was ever an end of the world scenario, I would want Tom Beck to be the one to tell me of the impending doom. Tom Beck’s address to the nation when the Messiah fails chills the spine. The plan to only select a million people from America to keep alive is one task that no person should burden but Tom Beck does what is needed. Tom Beck for 2020? When Earth is endangered by an alien invasion, you need a president that will be calm, measured and hopeful. But more importantly, a badass. 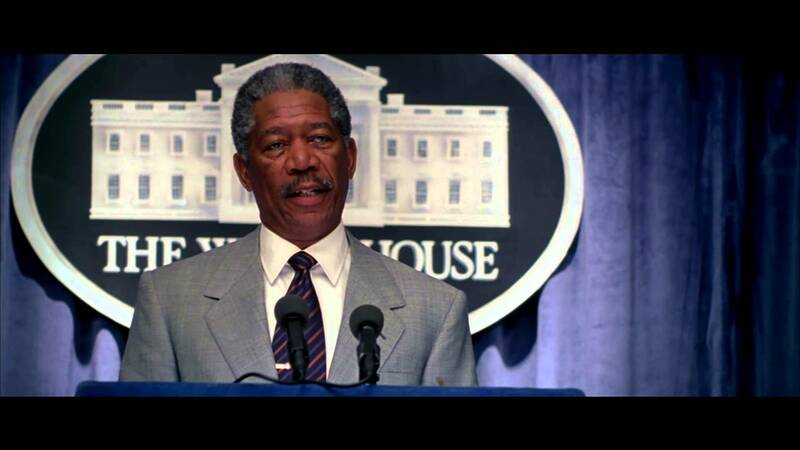 With one of the greatest speeches ever put on film, that would even get me out of my seat and fight for independence. He doesn’t just pull of the greatest speech in fact or fiction but he also gets in the seat of a fighter jet and fights for not just his country but the world. An awesome president that before the alien invasion was doing poor in the polls, thank god for the alien invasion because it probably got him 4 more years in office. GET OFF MY PLANE!! What if Die Hard was set on a plane and John McClane was replaced by the president of the United States and played by Harrison Ford. Welcome to the glorious film that is Air Force One. After Russian terrorists hijack Air Force One and kidnap the president’s family, President James Marshall fights through the gang of terrorists to try and save his family and his country. The pragmatic president solidifies the statement that if you want a job done well, do it yourself. One of the best action films on the 1990’s and Harrison Ford being Harrison Ford. Did I mention that this is just Die Hard on a plane? 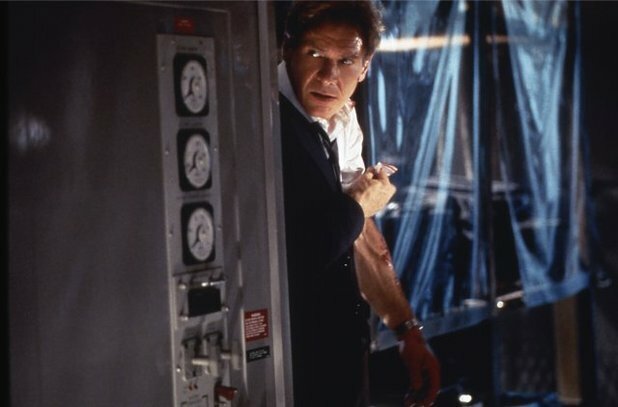 President James Marshall is easily top of the list just for the moment when he knocks Gary Oldman out of Air Force One and shouts GET OF MY PLANE!! !